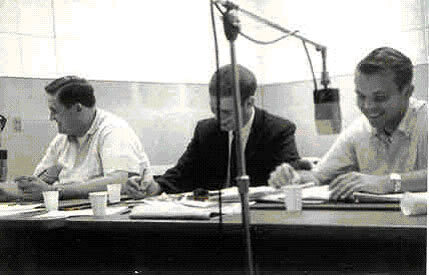 It’s great reading about our classmates who’ve already achieved that 50 years of married bliss milestone. Linda and I have 3 more years to go before we become members of that club. But we’ll get there. There’s no doubt about that. No, my doubts were that the wedding might not happen at all. she was a very bright and sophisticated lady......with a great sense of humor, and we were both in love, but........she didn’t have any idea how certifiable one of my best friends was. His name was Paul Niven, who very few people remember now, but at the time was part of Ed Murrow’s team of reporters at CBS. He was moderating Face the Nation in the early 60’s and I was the announcer on that show as well as a number of Paul’s radio newscasts throughout the week. But practical jokes...the more outrageous the better...were his life! Paul was one of the smartest people I’ve ever met.....and one of the funniest.....and kindest. But I knew that like all of Paul’s friends, I had a target on my back. And an up coming wedding was just too good an opportunity to pass up. I was convinced that the “terror attack” would come right after the wedding or perhaps during the honeymoon. So, a couple of weeks before the wedding, I didn’t think twice when Paul asked us to meet him and his date at a very exclusive restaurant (The Rive Gauche) in Georgetown. I spotted Paul right away when we entered and as Linda and I were being led to his table........Suddenly, I began to realize who his “date” was. 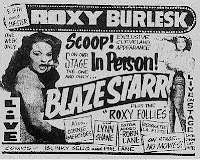 I recognized her even without her “boa.” It was the “Queen of the Block” and probably the best known xcydiast in the country, Blaze Star. This was ground zero....and the attack was about to begin. 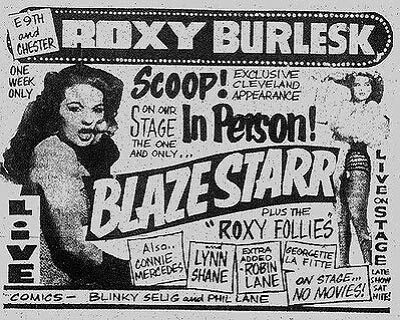 Blaze performed her part well.....telling Linda that she had been sent by the city of Baltimore to plead with her not to marry me....because the entire economy of the “block” would collapse without my many trips to the bars....."have pity on the strippers’ hungry children," she pleaded......Paul had also paid a couple of waitresses to come by our table with picket signs...with similar "unfair to Baltimore's working girls".....messages. Linda thought it was hilarious. I figured after that, the next 50 years would be a breeze. (After the initial shock....the rest of the evening was great. Blaze told us about beginning her career when she was 15.........and how she had been supporting her Mom and sisters in West Virginia ever since..and talked about her long-term romance with then-governor Earl Long. It was, to say the least, an unforgettable evening. 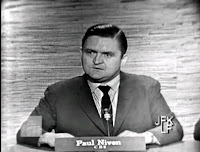 Paul Niven died in a tragic house fire in 1979. Linda was pregnant with our third child at the time......and since our other two children were boys, we were confident the new one would be too...so we decided to name him Paul, after our friend. But, our third child turned out to be a girl, so we named her Kendall, which was Paul's middle name. Ghost Riders or Big Foot?